I haven’t had my hands on clay for way too long. The new Silkscreen Kit from Premo Clay was the perfect way to jump back into the medium. If you haven’t experimented with polymer clay, stop reading this and go find some. You will be amazed at the gorgeous pieces you can make right off the bat, from jewelry to home decor and more. It is a medium that is very forgiving, versatile, and doesn’t require a bunch of expensive tools and equipment to get started. Today I will show you how I made a lovely necklace, bracelet and pair of earrings that I kinda love a bunch. You can make your own art jewelry with just a few simple supplies. Let’s get started! I began by mixing blue clay with pearly white to get my desired color. Just twist the colors together as shown. Continue twisting and kneading clay in your hands to mix the colors and warm/condition the clay. Conditioning is essential when beginning any clay project. It ensures the components of the clay are evenly distributed and the clay is soft and shapable. This clay was super easy to condition. I have worked with clay that is hard and brittle and takes forever to warm up, but this Premo was great! Continue until the clay is the color and shade you want. I used my Sculpey Clay Conditioning Machine to get a flat even sheet. This costs about $20 and is well worth the investment if you are going to create with clay more than a couple of times. You can also use a smooth glass, rolling pin or bottle to smooth the clay out on a bake-able surface. I like to use tiles I pick up at Habitat Restore for a dime. I have tons of them on hand for just this purpose. Once the clay is rolled out, you don’t want to have to move it, as it will become distorted and uneven until it is baked and therefore hardened. Having it on a surface you can just stick in the oven is super handy. The kit comes with silver metallic paint, gold metallic paint, 4 reusable screens (totaling 2 large single patterns and 12 mini patterns) and a squeegee. Aren’t the designs so fun?! I choose my design, placed a thin line of gold paint, and used the squeegee to pull the color across the screen, lightly so as not to indent the clay. Here is what it looked like after the first try! So easy and pretty. TIP: Make sure to immediately was the screen and squeegee so the paint doesn’t dry on them. You want to reuse them for as long as possible! TIP: Spray armor-all onto the cookie cutter inner and outer edge so that the clay won’t stick to it and come up off the surface when you lift the cutter away after cutting. Choose an area and a cookie cutter and press it into the clay to cut shapes. I used circles large and medium for the pendant an earrings. For the bracelet I used a small oval cutter. Pull the “scrap clay” away from the cut shapes and set aside. You can recondition it and reuse it, even if it has paint on it. Just mix it in by conditioning it with your hands or pasta machine. To create holes for jump rings in your pieces, you can use a toothpick while the clay is still raw, or use a bead reamer or drill after baking the clay. Manipulating the clay while raw always carries the risk of distorting it, so I usually wait until it is baked before creating holes. For this project I went ahead and made the holes while the clay was raw since I was going for an organic, imperfect feel. I baked my pieces at 260 for 45 minutes and let them cool. I painted the edges and back with a gold paint marker and sealed the pieces with Matte Mod Podge after the paint dried. I used 2o gauge gold wire to create jump rings, earring findings and a toggle clasp for my finished pieces. You can save money and get a unique look to your pieces by making your own findings, or purchase pre made findings. This new kit from Premo has ignited my clay jewelry flame once again! I have made several more pieces that you will be seeing in the future. I hope you are inspired to try some clay projects. It is so easy, inexpensive and you will be amazed at the gorgeous projects you can make from the get go. For more clay inspiration and product updates, follow Premo Clay on Facebook, Twitter, Pinterest, and Instagram! Disclosure: I received product and compensation from Polyform and Blueprint Social in exchange for my campaign. All opinions are honest and mine, as always! 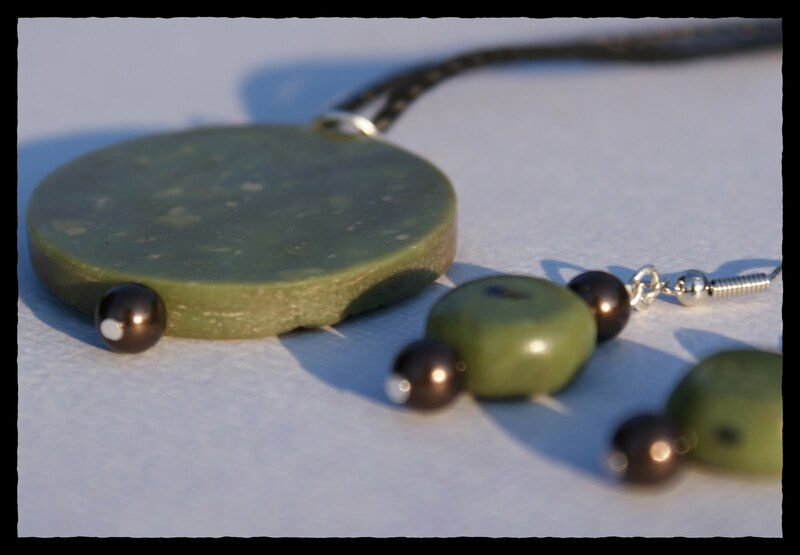 Check out what other bloggers have been up to using Premo Clay Jewelry Products! If you have never used polymer clay, this is a great project to get your feet wet. I love the stuff, and was inspired recently to create these necklaces by the popular Anthropologie ball beaded piece. I added my own twist of ombre color gradation and bead size gradation. I also went for a simple chain instead of a ribbon. The pearl finish was accomplished in one easy step that glazes creates the pearl effect, using Mod Podge Pearlized Glaze. Polymer clay is a perfect medium to create reproducible color gradient beads. You will see in the tutorial, I just rolled out white and blue (or corral for that version) to the same thickness in my pasta machine. Then I used a cookie cutter to cut 5 triangles of the main color for the central bead. The two adjacent beads are a mix of 3 main color and one white triangle. The next is lighter and smaller still, using 2 triangles of main color and 1 of white. You can use any recipe you want, just keep track of it, especially if you are making more than one of the bead in that size and color. This will make more sense when you see pics! For drilling, hold beads steady vice or bags of rice. Wear protective eye gear! Grab some clay and create your own gumball ombre jewelry! Have you seen the polymer clay/Sizzix kick going on here at SBLC? Well, I didn’t have a die to cut the exact circle I needed for these bracelet blanks, so I used a paper punch for a circle that fit perfectly. 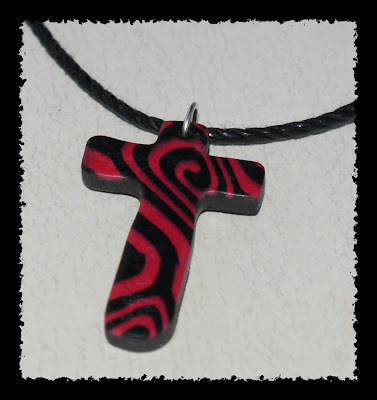 Today, I thought I would share with you another stamped polymer clay pendant. I recently signed up with Cindy Lietz’s polymer clay library, and was reminded about how fun it is to make bezel pendants with clay. The Polymer Clay Tutor video on stamped bezels inspired me to dive into these word pendants. If you are interested in developing your polymer clay skills, I cannot stress enough how wonderful, and under-priced, Cindy’s membership videos are. I am not being compensated in anyway for saying so, I am just that excited about the tips, tricks and inspiration jam packed into each video I have watched so far. Seriously, she is a fantastic teacher!! Back to the pendants, I love how simple they are to create, and how each one comes out a little differently. For this particular piece, I used the bezel from a pendant I scored for cents at a garage sale. I took a hammer to it and rid it of its glass covered image so I was left with just the bezel. Since the bezel was antiqued silver, I wanted to give the pendant an antique feel. I mixed scrap clay to get the aqua you see in the final piece. With my fingers, I mashed the clay into the bezel, and smoothed it out into its cabochon shape. Once I was happy with the shape, I used metal stamps for the word “JOY”, and a clear cling butterfly stamp for the butterfly. I used a stylus to add a little more texture randomly, then baked for 45 min at 275°. To finish, I used a mixture of glaze and black acrylic paint; painted the entire piece, then wiped away the glaze/paint mixture, leaving the black in the depressed areas. When this dried, I sealed with 2 coats of sculpey satin glaze. I love this stuff. It is easy to apply, dries to a lovely finish, and is inexpensive. What do you think? Don’t worry, I am still on my Sizzix kick. Stay tuned!! she used to color her pieces so vibrantly… acrylic paint! Who knew? These were fun and simple to make. Etching in raw clay makes the artist in me all smiles.